And…. we’re back! It’s been a busy holiday season for BJ and I, but despite being busy, we had some time to continue working on our home projects. I just ran out of time to keep you updated! I’ve added “write more blog posts” to my list of new year’s resolutions this year. Now that the holidays are winding down and we’re looking to the new year, we will once again change our home decor. The in-between seasons are always a fun time to decorate. They are sometimes a little challenging, but allow for a decent amount of creativity. Here is how we decorated after Christmas last year. I like to use decor that will translate from one season to the next. 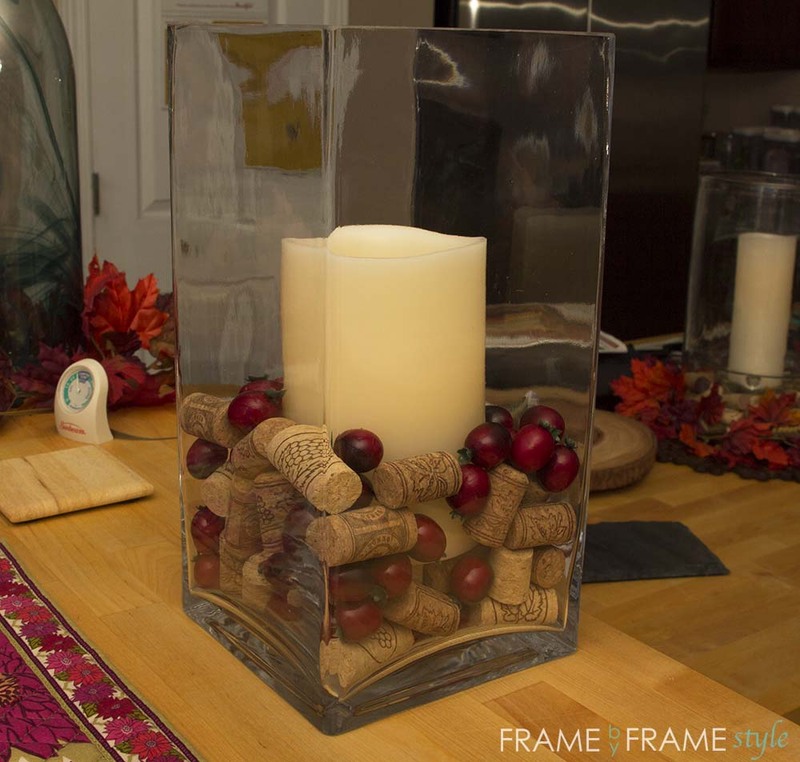 Before Christmas, I picked out two new vases, corks and cranberries to dress up our kitchen island. I chose the cranberries for their rich warm color, perfect for fall to winter decorating. 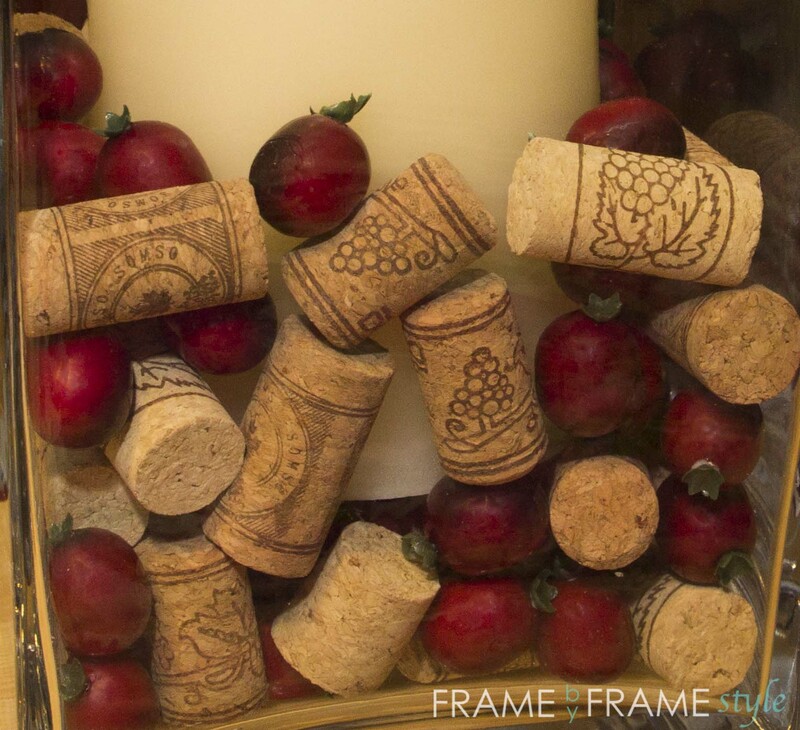 The corks are a nice earthy color, another warm color that can be for fall or winter. 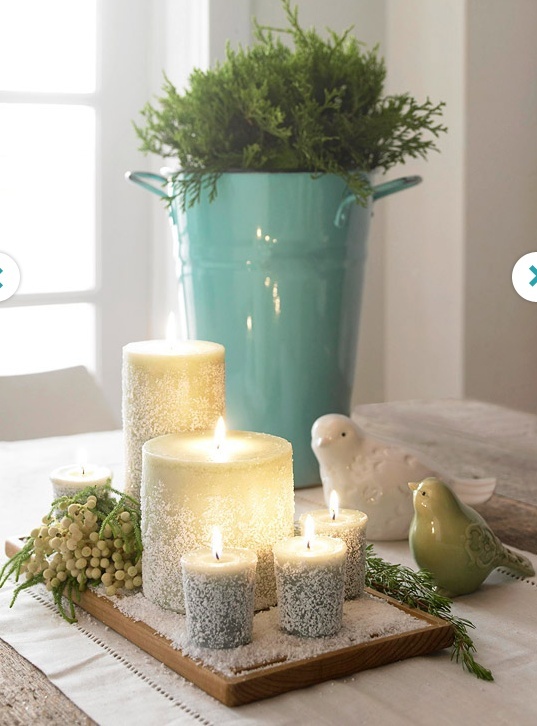 When choosing a candle in our decor, I almost always go with an led candle, unless I have no plans to light the candles. The candles in the picture below are led and have a timer on them. Every night they come on at the same time and go off at the same time. In our winter decor this year, I want to add some more greenery. I like this idea I found on Pinterest to roll candles in faux snow. I also like the birds because we have a few wooden birds that look like these. The pine in the vase might be a little harder to pull off because we do not have any pine in our yard and pine is hard to find after Christmas. The stores sell off all of their Christmas decor and move on to spring decor too quickly. Here’s an idea for a way to use branches from a real Christmas tree. 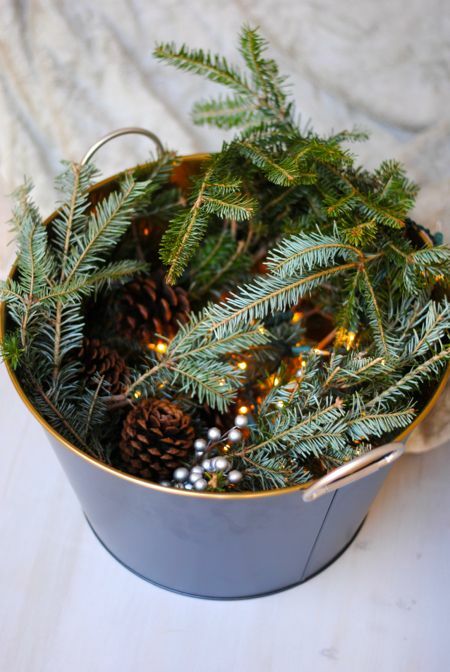 Before you throw the tree out, cut off a few branches and display them in a nice bucket with a few lights, pine cones and berry sprays. 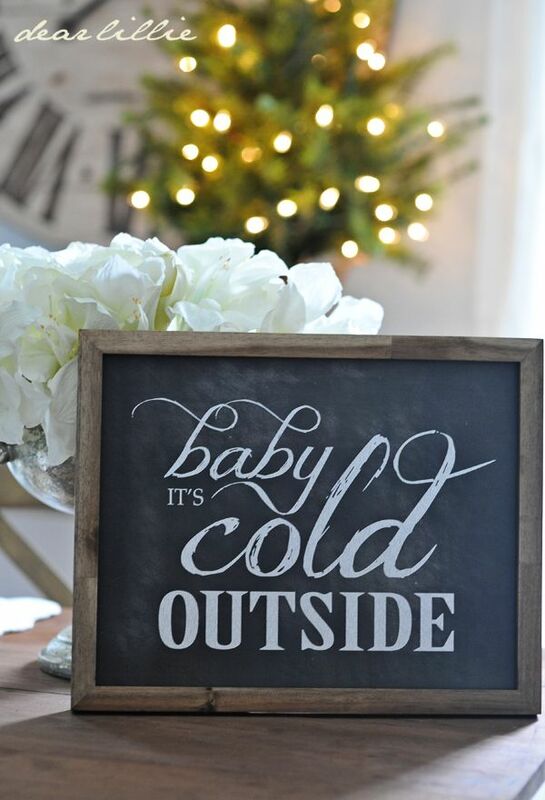 To decorate our kitchen chalkboard, I like this idea for a “baby it’s cold out here” sign. We still have several months left of winter and it will be cold outside. So, why not have this sign in your house after holidays? 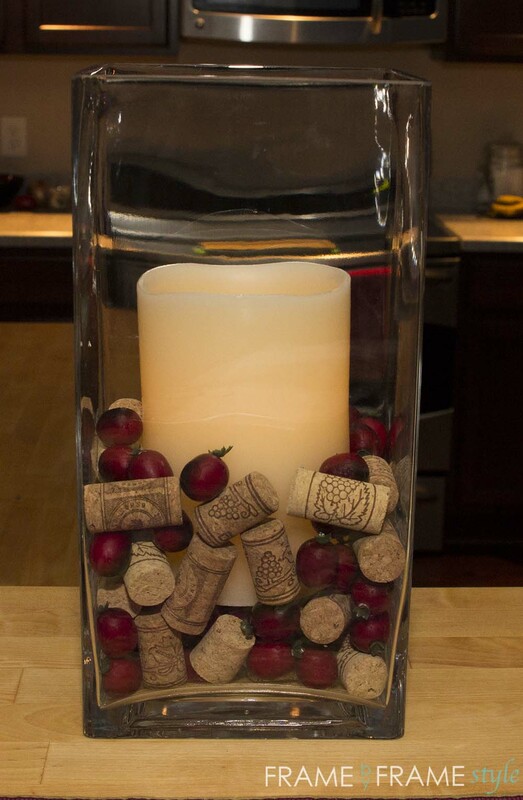 For more ideas, search “winter decor” on Pinterest. There are so many fun things you can do with winter decor. Be creative! You don’t have to put away all of your favorite decor items from Christmas. Keep a few winter items out and use them to celebrate the season a little longer in the new year! 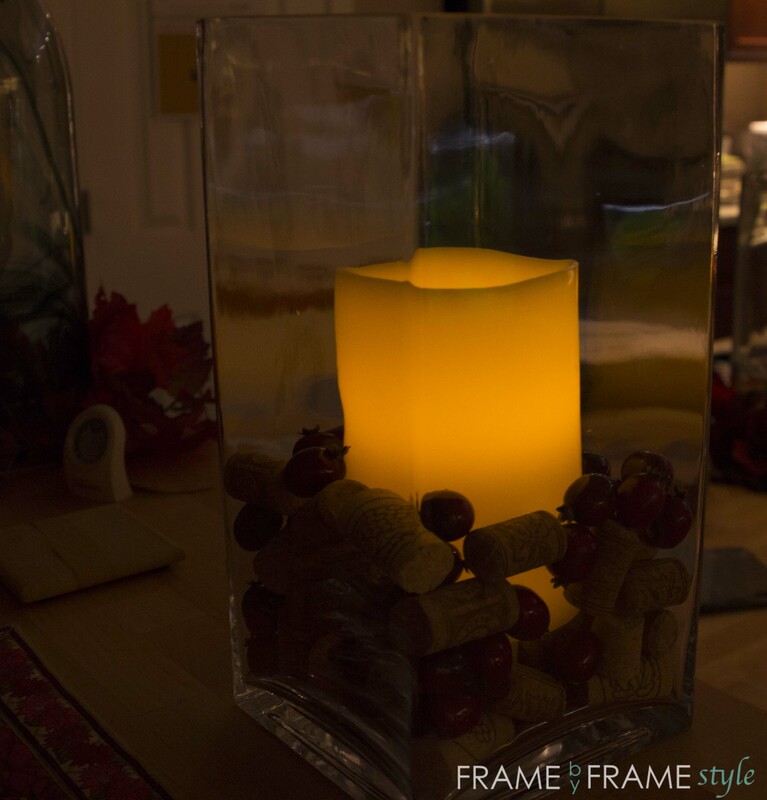 This entry was posted in Decorating with Color, DIY, Inspiration and tagged candles, Christmas, corks, cranberries, decor, Decorating, snow, winter by Frame by Frame Style. Bookmark the permalink.